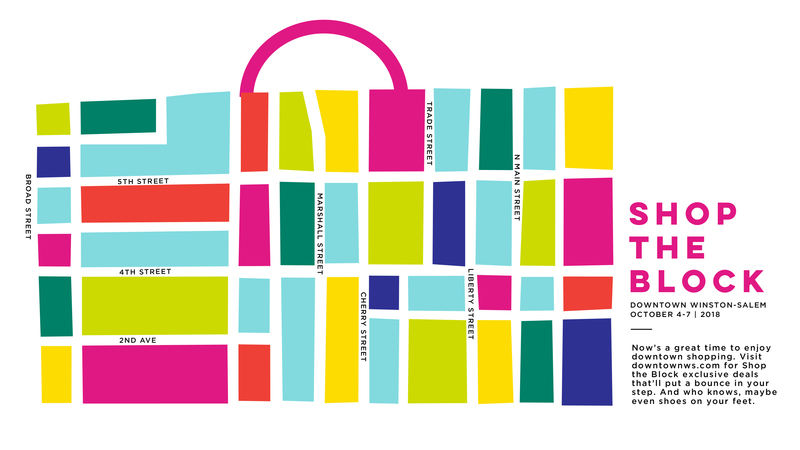 SHOP THE BLOCK: OCTOBER 4TH – 7TH, 2018 – Now’s a great time to enjoy downtown shopping. Listed below are the participating retail outlets and the deal/coupon each one is offering. A free Coupon Book comprised of each of the participants’ deals will be available at each participating retail outlet. Participating Stores and Deals are subject to change at any time. 15% off any purchase (including memberships, packages, merchandise, drinks). *cannot be used in addition to any current / ongoing promotion. If anyone has a current membership, the discount cannot be applied. Buy 3 candles get a free T-shirt. Some exclusions may apply. Cannot be used with other offers, on sale items, or to purchase gift cards. Limit one offer per visit. In-stock items only. Not valid online. 10% off total purchase. Cannot be used with the Frequent Shopper or Supporting Member Discount. Shop the Block Deals are valid October 4th – October 7th, 2018. Please check with individual retail stores on Hours of Operation. Coupons/Deals are subject to availability. If there is an error on this page, the official retail deal/coupon at the Retail Store is correct. Please check with retail store prior to shopping if you have questions about the coupon/deal.